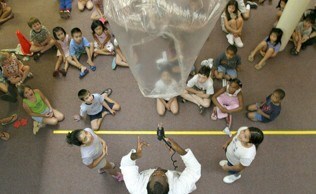 Mad Science Preschool Programs are engaging hands-on learning experiences for preschool children aged 3-5. Each workshop is an interactive, age-appropriate exploration of a specific science topic. Every themed program is designed to captivate the curious nature of young children. Preschoolers enjoy engaging demonstrations, perform simple experiments and will discover how science can help us better understand the world around us! Each 30 minute class is designed for 15 Pre-K students at a time. Here are some of our awesome topics for 3-5 year olds! Adventures in Air- Learn that even though air is invisible, it is all around us all the time. See how air has the power to both move items and to slow them down. Animal Friends- Become an animal and identify animal sounds as we learn all about creatures big and small. Butterflies- Discover all about butterflies: where they come from, stages of their growth & how they eat. Color Lab- Make a new friend, Mr. Roy G. Biv, while learning about the colors of the rainbow and experiment with your creative side while we mix colors. Digging for Dinosaurs- Discover the differences between meat eating and plant eating animals and look at some dinosaur teeth up close. 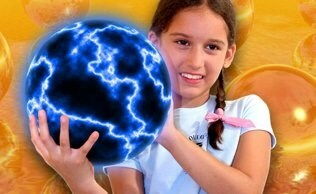 Energy & Motion- Explore the concept of energy and how energy gets things moving. Eye to Eye- Use magnifying glasses, kaleidoscopes and binoculars as we interact with a variety of optical illusions to illustrate that our eyes can sometimes play tricks on you. Fluttering Birds- Learn how a bird's beak is a valuable tool and how to identify different bird's songs. Healthy Choices- Discover what makes a healthy meal and why you need to keep eating fruits and vegetables to grow strong! The Human Body- Meet Mr. Bones and learn about muscles and body systems. Keep in Touch- Learn how to understand the world with your sense of touch as we discover that some objects are safe to touch while others are not. Let's Look Closely- Reveal hidden pictures and use hand held microscopes to observe objects closely. Let's Measure- Witness the basics of measurement when you get to measure all kinds of objects using scales and even your own feet! Lights On- What is light? Mix colors of light and explore the rainbow of light. Listen Closely- Experiment with wave motion models and twirling tubes to understand how sound travels in waves and can be heard in a variety pitches. Mad Mixtures- Create volcanoes and more simple chemistry fun! Make your own modeling dough to take home. Magnetic Attraction- Experience the poles and power of magnets in this hands on workshop as we make our own take home magnets. Sea, Sand & Surf- Explore the science of the sea when you learn what animals live in the ocean. The Science of Music- You will feel, hear and see the vibrations that help create music in this hands-on exploration. Space Frontiers- Take a trip through the solar system and sign up for the Mad Science Astronaut in training program where you can learn all about the elements of space. Taste and Smell - Join us for a journey through your taste buds and sense of smell. Water Works- Examine the different properties of water as we experiment with floating, sinking, absorption and so much more. Weather Wonders- Help create a cloud in a bottle and make it rain inside. Learn all about the water cycle and weather patterns. Wiggly World of Worms- Have an opportunity to get your hands dirty while learning all about worms. Get an up close look at the their lives and habits.